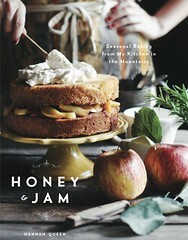 honey & jam | recipes + photos: my first daring bakers challenge - cheesecake! my first daring bakers challenge - cheesecake! I'm not good at making food pretty. Actually, I’m not all that interested in making food pretty. I understand why people do it, but I just don't care enough. I'm never going to be one of those people who spends hours draping a cake with fondant. I love the idea of it, but it's soon to be devoured! I want the food to taste good, and at the end of the day, that's what matters, right? Plus, most food is pretty on it's own, I think. Well, for this months Daring Bakers, my first ever challenge, I decided to give it a go The recipe was cheesecake, I LOVE cheesecake, and think it's pretty great on it's own, but this time I actually put in some effort and tried to decorate it. We were given a very basic cheesecake recipe and asked to jazz it up a bit. There is this recipe in Baking From my Home to Yours by Dorie Greenspan I’d been wanting to try for a while now, but just hadn’t gotten around to it, so I decided to combine the recipes. I used the gingersnap crust, apple cider, cinnamon and brown sugar from that recipe and added them to the recipe given. It turned out GREAT. The taste was awesome. My only problem was it had a soggy crust - I’d never done the water bath thing before and I didn’t realize you needed to wrap the bottom of your spring form pan with aluminum foil, I’ll be sure to do that next time. When it came to decorating, I drew a complete blank. How do you decorate a cheesecake that isn’t fruity or carmel-y or chocolate-y? I couldn’t just throw some berries on top and call it a day. 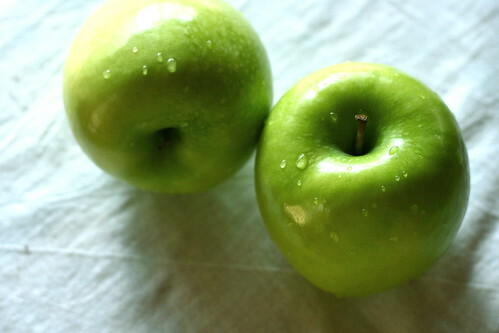 So I asked on the daring bakers forum and someone mentioned drying some apples in the oven. It was the perfect idea. Sure, it still looks a little “rustic”, but I like it. Plus, the apples tasted really good with the cheesecake, the crunch really added something. I’m really glad I joined daring bakers, it’s been a ton of fun, and I’ll definitely be making this recipe again. P.S. Don't forget about my giveaway. I think a lot of times people really over-style their food, in restaurants and on food blogs. Sauces, drizzles, and sprinkles of this and that can get out of hand really easily (been there, done that), and then the plate is too busy, and suddenly it's hard to focus on the dish because of the garnish. Simplicity is so much better... your food IS pretty, despite what you might think, and this cheesecake is no exception! This looks so yummy! 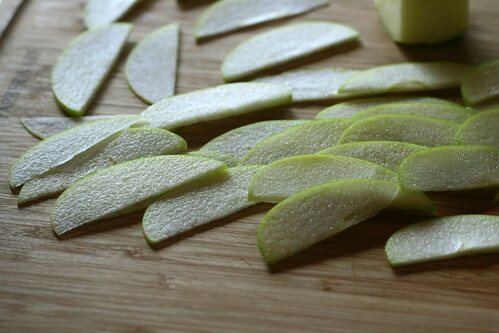 I might have to try it once apple season rolls back around. i haven't been daring enough to join db...but someday i think i'll take the leap. your cheesecake looks fantastic. Looks pretty to me. Congratulations on your first challenge! It looks beautiful! You have nothing to worry about. I also joined DBC in april and I can safely say, my cheesecake is not even compared to yours. Yours looks so lovely! For the soggy crust, instead of putting it in a waterbath, place the pan with the water in it in the bottom rack and your cheesecake on the middle rack. It should do the trick. Anyway, great first challenge! Welcome to DB! I must admit, I'm more for edible than pretty, but yours is definitely both. Awesome job! It came out so beautiful! The dried apples really give it that 'ole barrel of cider' rustic look, and your photography really brings it out! Fantastic job! I think your cheesecake is beautiful! 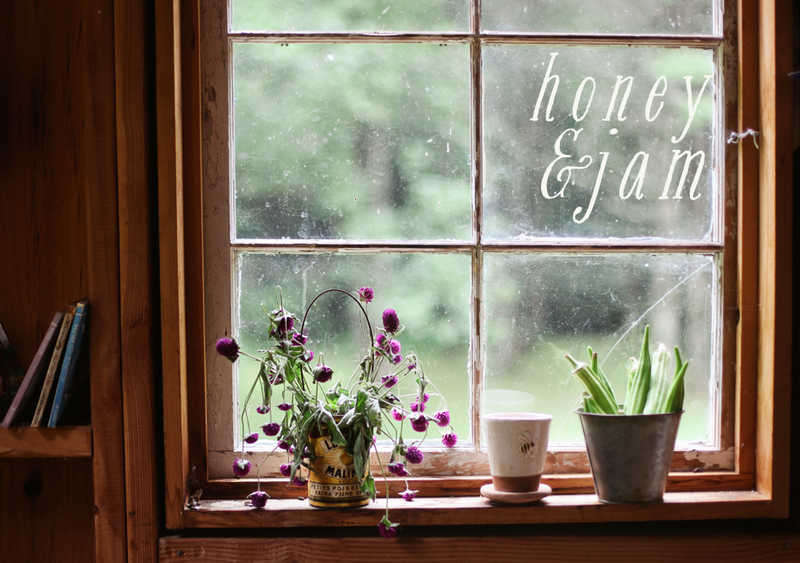 I have a hard time with styling too, and I get so frustrated sometimes about needing that "perfect" picture for the blog. I have a two year old who just wants to eat her food, not watch mommy garnish it and take pictures of it! oh WOW. the photos and recipe are incredible. when Autumn comes back around, this will be a fantastic use for the bushels we collect! 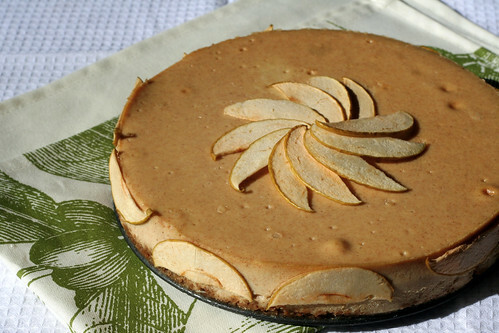 that is really *really* pretty♥ i would have never thought of dried apples and cheesecake, but girl it works! You did a great job decorating it! Actually, before I even started reading the post I was thinking, "Wow that looks so pretty!" It's a beauty! Nicely done. And, thank you for your kind words last week. I really appreciated it. I totally agree with you about the decorating of food. I love looking at it when others do it, but I'd rather just plop it on a plate & eat it. Hubby, on the other hand, loves the "plating" of food. 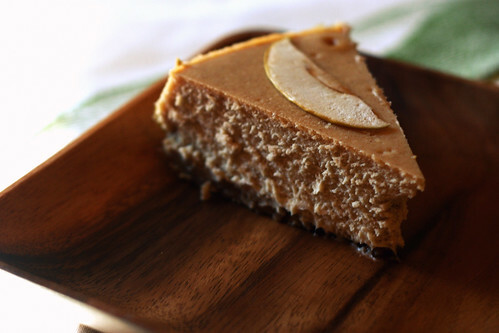 Your cheesecake looks great & the gingersnap crust sounds delicious! 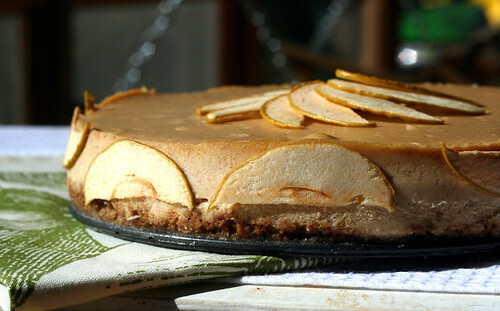 I LOVE the rustic feel of your cheesecake, and had never considered apple cider as an idea. It sounds delicious. Welcome to the Daring Bakers, and thanks for being a part of the challenge. Congratulations, that cake simply looks delicious. I'm going to try that out for sure. Thanks.